What you'll be doing is preparing the base, putting it at the bottom of a lined spring-form cake tin, baking it, letting it cool and then adding the cheesecake mixture before cooking in a hot oven. This is fun because you just get your home-made muesli or granola mix; grind it, ideally in portions in a coffee grinder till it's quite powdery but still has consistency; add liquid butter and mix into a doughy mixture, before molding it into the base of the tin. 3/ Push down into lined baking tin and cook at 180°C for 10 minutes; take out and press down the fluffed up base with a fork before putting back for 10 minutes. Remove and cool. 4/ Mix eggs, cream cheese, sugar/splenda/stevia mix, vanilla and lemon zest till they are smooth and then pour into spring form cake tin. 5/ Heat oven to 200°C before turning down to 180°C just before you place it in centre. Cook for 40 minutes; then switch oven off and leave in with door open. 6/ Some leave it plain or add some fresh berries to the surface. When cooled, I like to use a knife to spread a mixture of thick cream and mascarpone which have been whipped together over the top. Remove carefully from the spring-form and present to the world on a cake stand if you have one. First: try and get hold of full fat, fresh cream cheese (or make it yourself; see my recipe) often sold in the form of rectangular blocks. The commercially sold variety usually has air beaten into it which can lead to the cheesecake drying out and cracking when you cook it. Second: The best pan for baking a cheesecake is a spring-form pan. Make sure the bottom is greased when you press the nut and seed mixture into the bottom, and that the sides of the pan are well-greased – I suggest soft butter or a spray - when you pour in the batter. Third: Make sure all ingredients are at room temperature, letting the ingredients blend together better and giving you a smoother cheesecake. 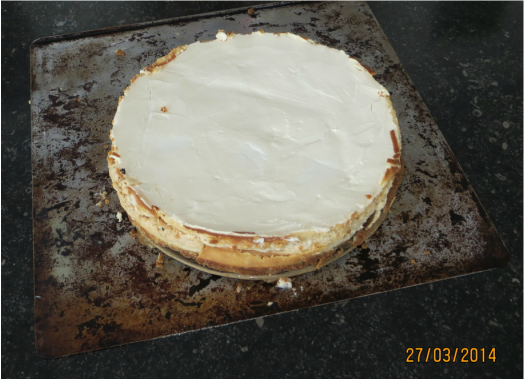 Fifth: Bake your cheesecake with a pan of water in the oven because a steamy oven will prevent the cheesecake from drying out… but don't put the spring-form pan in the water, because it might leak. Place a pan of water on the lower rack and bake the cheesecake on the upper rack. Sixth: Don't open the oven while baking! That’s just inviting cracks in the surface! My guideline is to first reduce the quantity of sugar in any regular recipe by about one third; then using half sugar/half sweetener by volume, the carb content will be reduced by about 2/3; fine for the occasional treat. 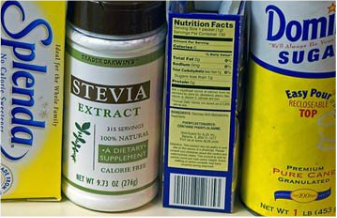 Use all sweetener (50:50 Stevia and Sucralose) if cooking for diabetics. All alternative sweeteners are lighter than sugar so follow their packaged instructions and: cut the quantities as your taste buds get used to less of that sweet taste you've become accustomed too.